The series continues with the Singaporean producer Fauxe and his journey towards sincerity. In this original series, Globetrotter discovers the rising musical prodigies of Southeast Asia who are more than ready to give you the Variations in Sound! For Part 5, we talk to Singapore’s forward thinking artist, Fauxe. Visit the Part 4 in the series, where we talk to Indonesia’s Diskoria Selekta. Ikhlas: the Malay and Indonesian word for sincerity; an act without deceit nor hypocrisy. What would “Ikhlas” sound like as a 16-track album? This is exactly what sparked our interest in the Singaporean artist, Fauxe. Though he did not come from a musical family, Fauxe’s interest in sound in general has started since he was still a young kid (this includes making noises with utensils or simply by being a chatter). 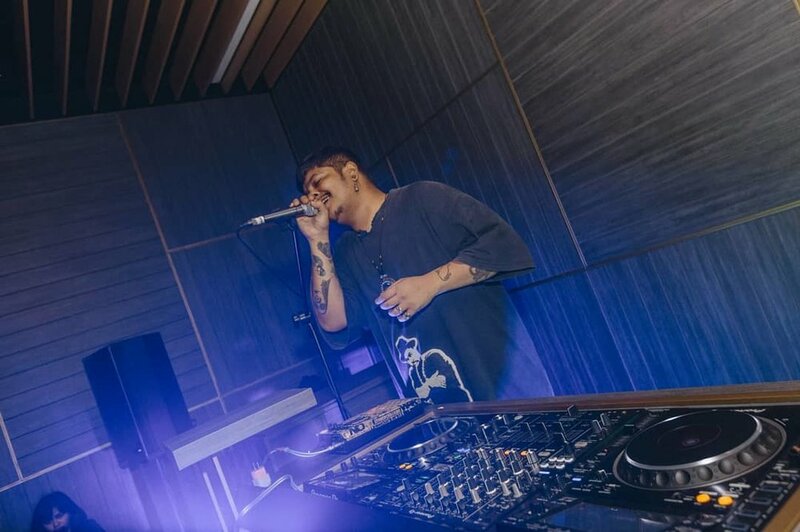 Known as a prolific artist in Singapore’s music scene, and having spend at least six years focusing on what he does, Fauxe has proven that he is able to tell stories through his music. No matter what the beat structure is, hip-hop or disco, old or new, he has left his personal mark on his Ikhlas album, which heavily features samples of old Malay tracks. Globetrotter had a chance to chat with the man himself during Nusasonic, a multi-year project that plunges into a broad spectrum of experimental sound and music cultures in Southeast Asia, enabling dialogue within the region, with Europe and beyond. Globetrotter Magazine: Your album, Ikhlas, took 8 months to make in Malaysia. What was your first initiative when you decided to sample a lot of old Malay records? Fauxe: I felt like being there and living there is the most reasonable way to work on Ikhlas. Of course, with sampling you can do it from anywhere. But it would sound off, at least to me especially. And I love KL, there’s something about the city that I feel very strong, culturally. Globetrotter Magazine: I thought Singapore was quite diverse when it comes to that matter too? Fauxe: A guy once asked me the same question. If you think about it, we already have everything we need in Singapore. I realized that, yeah we do have so many cultural things such as museums, the parks, even the people, etc. But to be honest, I don’t feel it. The difference to me, in Malaysia, I can definitely feel that; whereas in Singapore, I can only see that diversity. The tracklist from Ikhlas is also telling a story, from “Gaut” (taken from “Pulang Merantau,” which translates to “Returning home” in English) until the last track “Kampong” (“Balik kampong?” “Aku lebih suka tinggal di Kuala Lumpur”/ “Going back home?” “I prefer staying in Kuala Lumpur”). That really explains the moment, bit by bit about the journey. And to the younger generation too, I think that’s also relatable. From leaving hometown, the process of adapting, and then coming back home again. Globetrotter Magazine: I notice you put so many elements to this project, but can you explain to us what is Hawaiian Malay music? Fauxe: The term actually means Hawaiian inspired Malay songs. And I was just intrigued when I first discovered The Bintang Malaya Hawaiian Band [whose song “Nona di Kedai” features repetition of the word, “Guangho” - Ed.]. When I first heard it, it’s quite funny to me cause “Guangho” means overly enthusiastic sometimes used on the topic of war. The way they pronounce it in a very chill way all through the song is just very interesting and it got stuck in my head. I knew instantly I had to do something with this song and create it my way. Globetrotter Lab: And how exactly did you discover most of the old Malay records? Fauxe: Youtube. Because it’s so easy and practical. From one keyword to another, you can always find surprises. People might also find what I’ve found, but I know that no one can produce it the same as I do. The music that I produced, all of the old Malay records I mixed, is a part of my personal journey. Globetrotter Lab: What you’ve been doing is fascinating. We’re curious, is there any more to come from Fauxe? Fauxe: Working on a project for 2019 and beyond. I am going to form a group actually. I always believe that you can always do more and give people an unforgettable full-on experience once you focus on the live performances. I want it to be carefully curated, almost like creating it as a gift to all of the listeners. I notice everyone’s reaction towards Ikhlas is positive, so I’m going to let it has it own moment while I’m working on this. I have actually started the process as we speak now. I’m excited. Globetrotter Lab: You mentioned before, the scene back home is diverse. Can you recommend us some places to go to experience the local music scene? Fauxe: [Laughs] Obviously I don’t go out that much. But, I’d say Headquarters, they have good DJs playing there, Canvas and Kilo. And, check out also The Moon. I work there most of the time, so say hi when you’re there! We continue our search for Southeast Asia’s music prodigies with Malaysia’s singer/songwriter and Yuna’s protégé, Bil Musa. In the Part 2 of our Variations in Sound series, we continue our talk with another Southeast Asian music prodigy: Random Brothers by Blood, the modular synth connoisseur from Indonesia. In this ongoing series, Globetrotter talks to Southeast Asian music prodigies we think you should know. A representative of Jakarta's electronic music scene, indie label Divisi 62 is our first prodigy.